Today, US Windsurfing is releasing a totally free mobile app that’s going to take your windsurfing to the next level! Well, it won’t exactly teach you how to feather your jibes or duck your tacks, but we’re definitely hoping it will make the time you spend on the water more enjoyable! It catalogs all major windsurfing spots around the country. We have 600+ ocean, intracoastal, lake and river spots to-date, with more being added regularly. It provides basic information on each spot (dominant wind direction, parking, rigging area, map and directions, facilities, things to watch out for). You can visualize spots based on how close they are to your current location, thanks to the GPS in your phone (just turn on your Location Services). 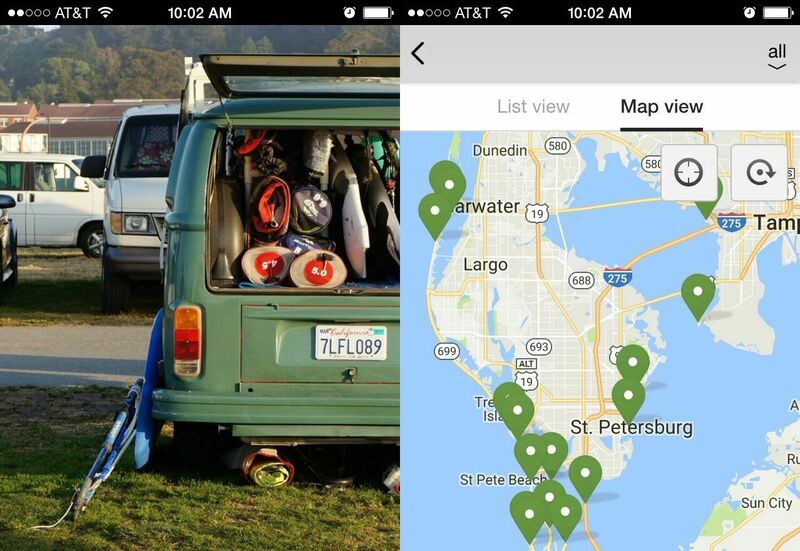 Or just go to the map and explore an area for your next road trip. You can check-in at a spot. 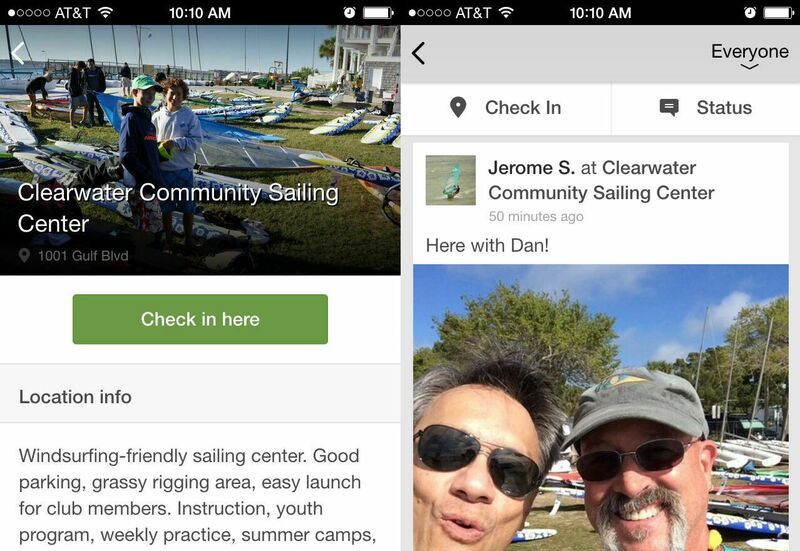 Post a comment and a picture to let your buddies know where you’re sailing today and what you’re up to. Your friends on Facebook and Twitter can get a copy as well. As a result, you can check out where everyone is sailing today and start loading up the car to meet them at the beach! The front page and map view in WaterSpotr! The WaterSpotr app is an opportunity for windsurfers to explore new venues and connect with each other – because it’s more fun when you’re not sailing alone! The app is quite powerful but we also wanted to make it very easy to navigate. Watch the short tutorial that Charlotte Samson put together for you and you’ll be on your way in no time: http://uswindsurfing.org/waterspotr. This app is the result of a massive group effort! It relies on information from many contributors who have tirelessly roamed the land – and water! – to take stock of all the beautiful spots in their respective regions, snap pictures and write up details for everyone’s enjoyment. We’re very grateful to everyone who contributed. This is grassroots community-building at its very best! We hope you’ll enjoy using WaterSpotr. Install it, use it on your next session, post something, spread the word – the app is what you make of it! Your friends at US Windsurfing. Checking in at your local spot using WaterSpotr! Haven’t checked it out yet, but is there a way we can add launches? Hi Brian! Just use the ‘Leave a reply’ form at the bottom of this page: uswindsurfing.org/waterspotr/, and send us the GPS coordinates and a short description for each spot you want to add. Looking forward to your input! Next story Big Day in Seattle! Previous story Celebrating our 2016 Slalom National Champions!